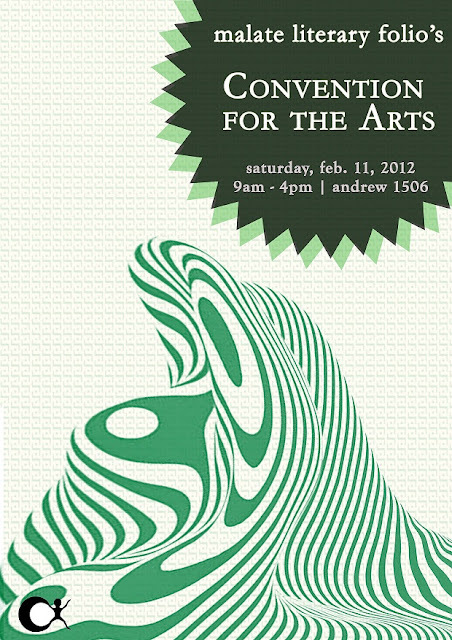 The Malate Literary Folio, De La Salle University-Manila’s official art & literary publication, will be holding its annual Malate Convention for the Arts on February 11, 2012 (Saturday), from 9:00am to 4:00pm. It will held at Rm 1506 of Bro. Andrew Gonzalez Building in DLSU. Malate Convention for the Arts is a seminar where prominent Filipino artists, photographers and writers will be sharing the craft of their expertise. Speakers include: Marc Gaba (Poetry), JP Cuison (Art), Romain Rivierre (Photography), and Genaro Gojo Cruz (Prose). This event is open to non-Lasallians as well, provided that they confirm their attendance by sending an e-mail to: juliodiego.ibarra@yahoo.com. RSVP on or before February 9, 2012 (Thursday), 3PM. For more info regarding the activity or wish to confirm your participation, please contact Deng Queddeng at +63.916.6084510 or email joanna_queddeng@dlsu.ph.